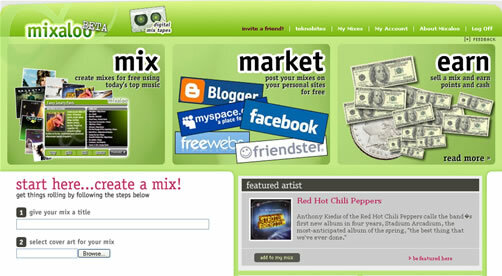 Mixaloo is a company which allows you to create mix tapes or playlists from music tracks on the web. You can share these mix tapes in your blogs or social networking profiles, when someone buys these tracks you will get paid from the sale. The current share is 50/50 between you and mixaloo. Creating playlists is free and you can create any number of playlists, but if your visitors or friends wants to hear them they have to buy these tracks. You can search for artists, albums or tracks and select the tracks you want to add to the mix. Mixaloo has around 3 million songs in their catalog so you have better chance of finding your favorite music tracks. This is an interesting idea and has lot of potential. One good thing about this is the revenue share with the users, if the users promote mix widgets actively mixaloo will become popular soon. See the below widget for demo purposes.